Nvidia is currently upgrading its SaturnV AI supercomputer with Volta DGX-1 GPUs in order to push the crunching power for its autonomous driving program. The SaturnV will be capable of 40 PetaFLOPS in FP64 mode, making it one of the top 10 AI supercomputers worldwide. The latest TOP500 supercomputer list reveals that Nvidia helped equip 87 of the world’s fastest supercomputers with GPU chips like Tesla and Volta. Nvidia also provided the necessary hardware for 14 of the top 20 energy-efficient supercomputers. Since it has been involved with such hardware for quite a while now, the green company went ahead and built its own AI supercomputer codenamed SaturnV, which will be upgraded with new Volta GPUs, as unveiled by Nvidia’s CEO Jensen Huang at the Supercomputing 2017 event. The upgraded SaturnV will help crunch the numbers for the company’s autonomous driving program. 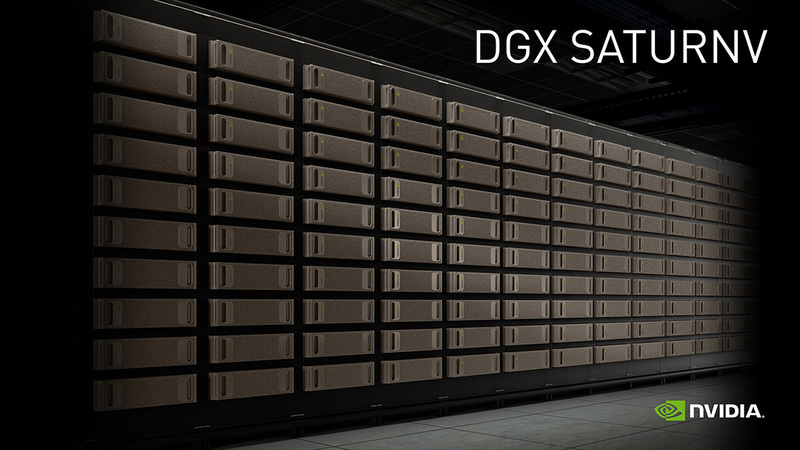 Currently, the SaturnV supercomputer is equipped with Tesla V100 GPUs, but Nvidia intends to upgrade these to the newer Volta DGX-1 cards. After the upgrade, the supercomputer will comprise 660 nodes spread over 5 rows, amounting to 5,280 GPUs that can crunch 660 PetaFLOPS in FP16 mode and 40 PetaFLOPS in FP64 mode. The new SaturnV is estimated to land directly among the top 10 AI supercomputers worldwide. Nvidia is also providing Volta GPUs for the Summit that will soon be finalized at the Oakridge National Labs and will become world’s fastest supercomputer. Along with the new GPUs, Nvidia is offering new software tools and applications that simplify the deployment process down to a few minutes. The Volta GPU is expected to make its commercial debut with the GeForce GTX 2000 series in early 2018.